The album This House is Not For Sale is, by most accounts, not a milestone in the career of Bon Jovi. The set debuted at number 1 and then took the largest drop from the top of the charts in history, all the way to 43 in its second week. 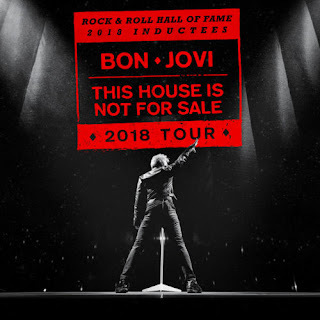 Bottom line, that's not that big of a deal when you are still selling out stadiums around the country and that's what Bon Jovi will be doing for two months with the 2018 North American leg of their This House is Not For Sale Tour. They are also releasing a brand new edition of the This House is Not For Sale album with two new songs, "When We Were Us" and "Walls". This House is Not For Sale (When We Were Us) will be released on February 23.